PIKESVILLE, Md. – A herd of buffalo somehow got loose and wandered around an upscale neighborhood Tuesday, disrupting traffic and alarming homeowners before officers managed to corral them in a tennis court. More than a dozen police cars and a police helicopter were used to herd the roughly 10 beasts, authorities said. “Somehow they figured it out; I’ve got to give a lot of credit to the creativity of our officers,” police spokesman Shawn Vinson said. Police shut down several major traffic arteries, including a section of the Baltimore Beltway, while they tried to anticipate which way the buffalo would roam. 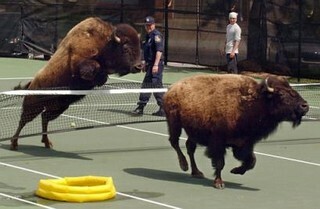 Officers eventually managed to maneuver the buffalo onto the tennis court about a mile from where they first were spotted. In a related note, most of the AA meetings were fully attended this afternoon.